It was a morning hunt and I have only hunted this area one other time. I saw two does late in the evening the first time, but no shot... too dark. Anyways... I had been seeing nothing but bucks all morning, spikes mostly. At about 8:45 am I had something catch my eye just off to the right of me, moving from right to left. It was a white deer. It turned left and headed towards me, but never came closer than 40-45 yards to me. I tried grunting him back, but I never got any reaction from the deer. He had an 8 point configuration to his rack, but it looked small as he headed back to where he had come from. I saw a few more small bucks in the next half hour. Then I looked to my left and I saw the white deer 55 yards away looking in my direction, but looking a little bit behind me. I was hoping he would come into the strip of hardwoods I was in. Still looking behind me, I turned to see what had his attention. It was a doe not 20 yards behind my left shoulder. She snuck by me in the wet leaves. I slowly turned to keep an eye on the doe to take a shot at her if the buck did not co-operate. Just then the buck started into the woods which made me forget about the doe. The buck was now walking left to right and at about 40 plus yards. I gave a few soft grunts and he cut towards me just a little bit. Because I ranged out the area I kind of knew how far away he was going to be if he kept on his present path. Thirty-yards would be the distance. I came to full draw and he was still walking. My pin was on him, but I did not want to shoot at a moving animal. I was thinking that I had to make a noise to try and stop him. When the thought entered my mind he stopped. I eased the sight pin and released the arrow. 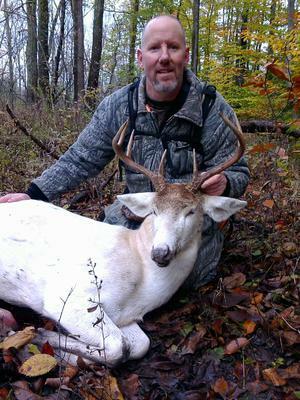 It was a nice hit, because of his white hide I could see the arrow hole as he vacated the area. He only went 40 yards or so and stopped, never looking back. He just stared forward. I was waiting for him to drop, but he stood there for what seemed like two full minutes. Then he weaved without moving his feet and proceeded to bed down. He was lying on his belly with his head forward. In this posture I knew he was alive, The only movement I saw was a twitch of his right ear a few times a minute. I knew he was not getting up, but was wondering where exactly the arrow hit him. It looked like a great shot. He was in this position for I bet 3-4 minutes. I was texting my hunting partner Dave Mathews when I heard a sound from the area of the downed buck. He finally rolled over to his left side and kicked around for just a few seconds and he had expired. I watched the entire scenario from my tree stand about 50 yards away. He was easy to see being white on a brown forest floor. The angle of the hit was actually a slight quartering to and not a broadside shot at which I first thought. I hit him just behind the shoulder and came out behind the far left lung missing it completely, hitting his liver on the way out. He was not going far with two organs damaged.